ABU DHABI, UNITED ARAB EMIRATES--(Marketwire - October 20, 2010) - Cisco (NASDAQ: CSCO) announced today that the Abu Dhabi Police has chosen to deploy Cisco® Unified Communications technology solutions at its headquarters and throughout its branch offices across the United Arab Emirates to help create a safer society. At a ceremony held at GITEX 2010, the Abu Dhabi Police confirmed that Cisco IP telephony solutions, which provide an enhanced infrastructure for the transmission of data, voice and video, will be installed at its headquarters and branch offices throughout the Abu Dhabi emirate. The Abu Dhabi Police service is using the latest innovations to provide better public services. The deployment of latest Cisco Unified Communications and collaboration solutions is an example of these innovations. The police service needed a flexible, scalable and highly secure infrastructure to be able to deploy more services and applications. Ease of communication between all stakeholders (HQ, branches, staff and public) was also a key requirement. Cisco Unified Communications solutions help to improve workforce productivity and lower the cost of operating branch offices by simplifying management and reducing the necessary equipment. The solutions are designed to improve communication with constituents and to meet regulatory compliance requirements. The Abu Dhabi Police service is addressing the complexities of the workplace where employees are geographically dispersed and information overload is considered normal. The Cisco solutions will help broaden the scope of collaboration within the police service to encompass document and text-based applications such as e-mail and instant messaging, as well as team workspaces and voice and video conferencing in a way that matches each individual's needs. With IP telephony being the first phase of this deployment, the aim is to consolidate all the police's branch and the headquarters infrastructure in the emirate of Abu Dhabi into a single unified IP telephony system to include voicemail, unified messaging, presence and the Cisco Unified Personal Communicator. This will allow future services to be rolled out more quickly to enhance communications and provide citizen services to the wider community. "The Abu Dhabi Police is seeking to keep up to date with the latest advancements by implementing the best international practices in the field of information technology, to achieve our aim of preserving safety and security for the whole community. With Cisco collaboration solutions, we will be able to achieve our goal of improving and accelerating interaction between our teams, thereby helping citizens to access relevant business information in real time. The solutions will also enable faster decision making and increase responsiveness to the public needs." 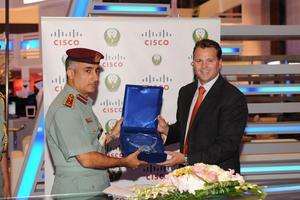 "As the UAE continues to build a world-class city, Cisco supports the UAE in delivering world-class citizen services. Cisco is helping Abu Dhabi Police to take a holistic approach to achieving a highly secure communications environment by providing the strategies, tools and resources needed. Our technology solutions will enable the Abu Dhabi Police service to improve its information management processes, enhance citizen communications, and increase interorganizational collaboration." Maintenance of security and stability is the main goal which Abu Dhabi Police General Headquarters aims at. We are keen to assume our responsibilities to achieve this goal in response to the directives of H.H. Sheikh Khalifa bin Zayed Al Nahyan, the President of UAE and his belief that security is the central pillar of growth, prosperity and safeguarding public gains. From this principle Abu Dhabi Police General Headquarters makes every effort to maintain security and stability availing all human and financial capabilities to achieve this goal. Cisco (NASDAQ: CSCO), the worldwide leader in networking that transforms how people connect, communicate and collaborate, this year celebrates 25 years of technology innovation, operational excellence and corporate social responsibility. Information about Cisco can be found at http://www.cisco.com. For ongoing news, please go to http://newsroom.cisco.com. Cisco products in the Middle East are supplied by Cisco Systems International BV, a wholly-owned subsidiary of Cisco Systems, Inc.
Cisco and the Cisco logo are registered trademarks or trademarks of Cisco Systems, Inc. and/or its affiliates in the United States and certain other countries. A listing of Cisco's trademarks can be found at www.cisco.com/go/trademarks. Third-party trademarks mentioned are the property of their respective owners. The use of the word partner does not imply a partnership relationship between Cisco and any other company. This document is Cisco Public Information.